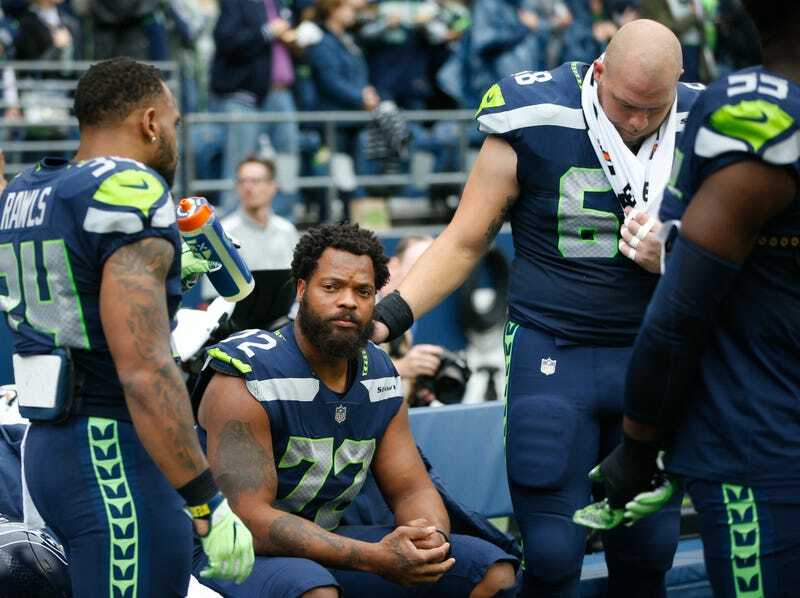 Seattle Seahawks defensive lineman Michael Bennett says the issue of Colin Kaepernick’s unemployment needs to be addressed before players and the league can move forward with talks on how to work together on social causes. “I think the first step to even being able to even have a conversation is making sure that Colin Kaepernick gets an opportunity to play in the NFL,” Bennett told ESPN Wednesday. “I think before we even negotiate anything about whether we sit, whether we stand [during the national anthem], it should be a negotiation about opening up the doors for Colin Kaepernick and giving him an opportunity again, because I feel like through everything, that’s been lost. “All of us are having an opportunity to be able to speak to our employers, but to think about the guy who started everything not to be able to have a voice at this moment, it just doesn’t seem very right to me,” he added. The league reportedly had meetings with players Tuesday, but Bennett had practice with the Seahawks and could not attend. Some players who did attend told Bennett that Kaepernick’s name came up in the meetings, but there wasn’t much discussion. Bennett doesn’t believe it’s possible for players and the league to move forward without Kaepernick being the start of the dialogue. It is commonly believed that Kaepernick has been kept out of the league because of his silent protests against racial injustice during the playing of the national anthem before NFL games. As for the league, Commissioner Roger Goodell announced Wednesday that he believes players should stand for the national anthem. League policy says players should stand during the anthem, but does not require that they do.